Have you ever tried to seal noodles in a pocket, this is an exciting blend noodles, vegetables and sauces sealed in the wrapper and baked until crisp. Baked to make it healthier and low-fat. However it can be deep-fried if calorie is not a concern. This is a delicious and crunchy without deep frying. This can be enjoyed for evening snacks and makes a good party appetizer. Heat oil in a wok over high flame, add in spring onion whites, carrots, bell peppers/capsicum and stir fry for 3-4minutes over high flame. Add in noodles, cabbage, chilli sauce, soy sauce, salt and cook for 2-3minutes more. Once heated through and veggies are tender turn off the flame, stir in spring onion greens and allow it to cool completely. For sticking rolls mix plain flour in water to make a thick paste and keep aside. Pre-heat the oven at 200deg C. line the baking tray with parchment sheet and set aside. Take one spring roll sheet and spread the paste on the sides. Now take a generous amount of noodles mixture and put it on one end of the sheet. 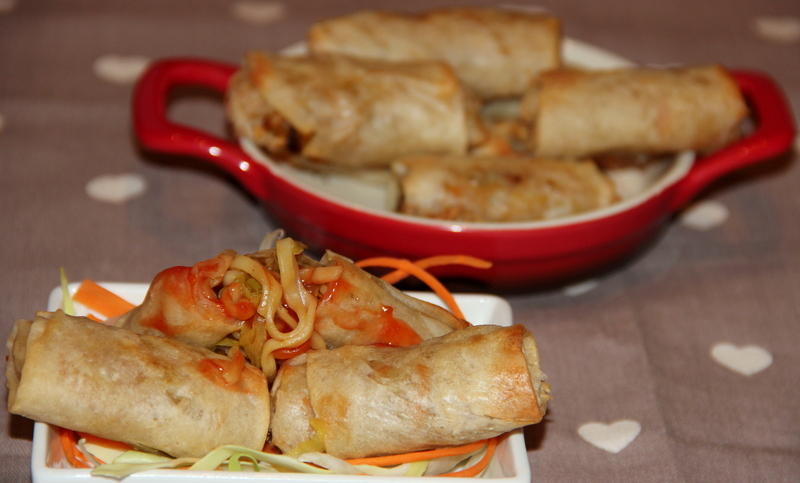 Roll the spring roll sheet tightly, sealing the ends securely with flour paste. Repeat with the remaining ingredients to make more rolls and arrange it on the lined baking tray. Lightly spray with oil and bake for 12-15minutes/until slightly golden and crispy. Serve hot with sweet and chilli sauce/ketchup. I used homemade spring roll sheets, super market phyllo/filo sheets/spring roll sheets can also be used. Fillings can be personalised as per the taste. Posted on October 26, 2014, in Appetizers, Indian, International, Starters. Bookmark the permalink. 10 Comments. I love spring rolls of all kinds. Fish, pork, chicken and vegetable you name it I am going to love it. Unfortunately I cannot eat wheat so I have been using rice paper wraps. Not a bad substitution and works well enough. Thank you for the idea of baking instead of frying.